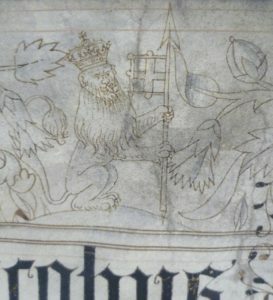 The word ‘Livery’ refers to an old trading body. 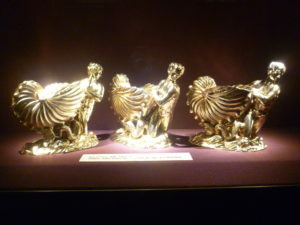 Some of the City Livery Companies are still active in their trade, for example, the Worshipful Company of Goldsmiths still controls the purity of all gold and silver objects made in the U.K.. All Livery Companies are also charitable institutes, involved in a variety of activities which reflect their historical interests. 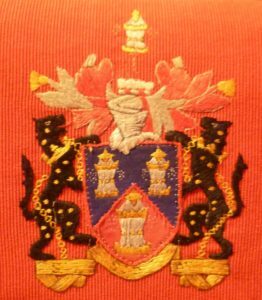 The Salters’ Company is a dead Livery Company, which means that it no longer deals in the salt trade but remains active with regard to its charitable works. Currently, it has between 150-160 members; either by patrilineal descent – and nowadays that can include daughters as well as sons – or through redemption, that is, purchasing privileged admission to the Company. The Salters’ chosen area for its charitable works is education, especially in chemistry where they make grants and offer educational support. They have also set up Room to Heal, a community for refugees and asylum seekers who have survived torture, with a comprehensive programme of therapies and support; together with other initiatives to help the vulnerable and disadvantaged. 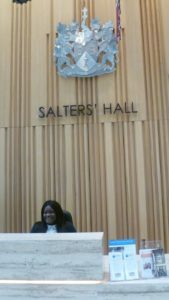 The Salters’ Company also historically shares responsibility with the other Livery Companies for the governance of the City of London. They are involved in the Lord Mayor’s Show, for example, and in other formal City of London occasions. To date, the Salters’ Company has had three Salters’ Halls. The first, in Bread Street near the wharves on the River Thames, burnt down in the Great Fire of London in 1666. The second Salters’ Hall, a classical Georgian building between St Swithin’s Lane and Walbrook, opened in 1827 but was destroyed during the Blitz in 1941. The current Salters’ Hall (1976) in London Wall Place was designed by architect Sir Basil Spence, and, its imaginative restoration and extension in 2018 won a RIBA Award. So, what’s it like inside the Hall? 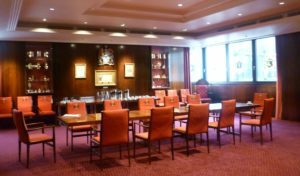 The Salters’ Hall combines a number of modern, multi-purpose rooms which include references to its traditional Livery Company past. We see this in the portraits of various worthies in their scarlet fur-trimmed robes; the elegant 18th century sideboard in the ladies’ dining room; and show cases of beautiful saltcellars, some porcelain, others silver, together with a variety of historical artefacts. A a number of the rooms are for hire, for example, the Ladies’ Dining Room – ladies didn’t qualify for membership until the 21st century, so they had to dine separately. Nowadays, the room is hired out as a small dining-room, seating 18-20 guests. The scarlet-backed dining chairs display the Company’s embroidered coat of arms with its Latin motto Sal Sapit Omnia, which means Salt Savours All. Upstairs, is the Minstrels’ Gallery which looks down on the Main Hall. The space is wide enough to be used for children’s educational activities. A number of carafes, glasses and plates on a long trestle table, indicate that it can also be used for hospitality. 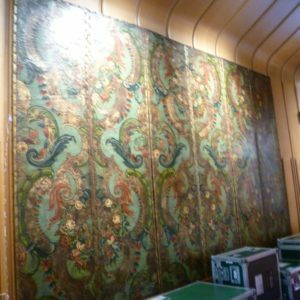 A dramatic 16th century coloured Spanish leather screen – discovered hidden in a cupboard; somehow, it had survived the Blitz – was secured against the back wall. It was a bit of a hotchpotch but it worked, and gave the impression that the space was well-used in a variety of ways. 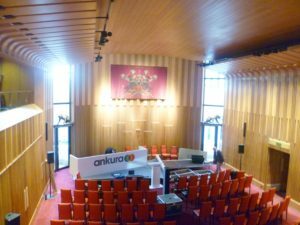 On the day I visited, the Main Hall, an ash-panelled room which can be used for practically anything, was being fitted up for some sort of performance, perhaps a musical evening; the acoustics are excellent. It can also be converted into a space for luncheons, dinners, and wedding receptions, etc. Ash is a light-coloured wood which is both stylish and modern and gives the space a sort of light warmth, without being heavy. 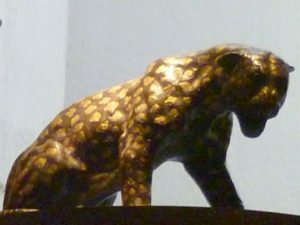 Two large black gold-spotted heraldic leopards stand on a ledge half way up each long window and add a touch of gravitas. Various items from the Salters’ Company’s superb salt collection are displayed in the Foyer, a space with a gently arched ceiling which echoes the mines from which the rock salt was extracted. 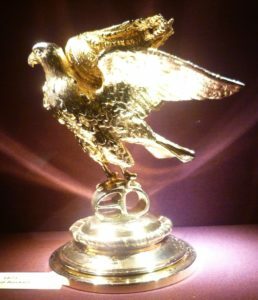 Saltcellars became status symbols and there are some beautiful examples, such as the Tritons towing sea shells through the waves by the renowned silversmith, Paul Storr. These came to light in the Antiques Road Show and were subsequently bought back by the Salters’ Company. 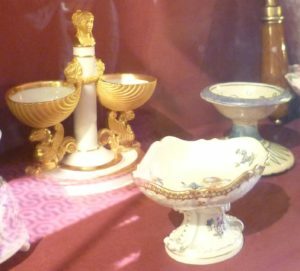 Personally, I was very taken with the porcelain saltcellars on display in the Ladies Dining-room, including a delightful tiny saltcellar in the shape of an acorn. 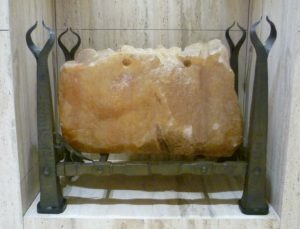 They also have a number of items relating to the company’s history, for example, the fireplace containing a huge lump of rock salt from Pakistan. 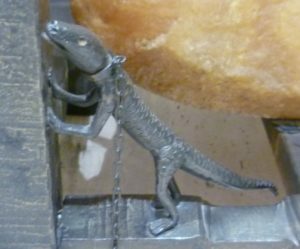 A salamander, a creature fabled to live in fire. I particularly liked the salamander – a symbol of Pakistan – in the bottom left hand corner. 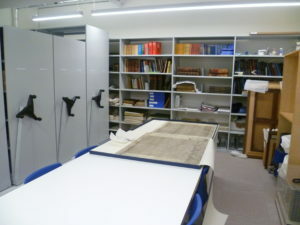 Lastly, we looked at the archive room where the archivist had laid out King James I’s Salters’ Company charter. 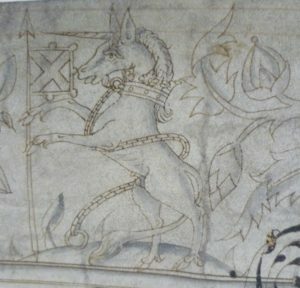 It is a work of art in its own right: hand-written on vellum, the top border is decorated with a variety of symbols: the English lion, the Scottish unicorn, a Tudor rose and King James himself, enthroned and holding the sceptre. 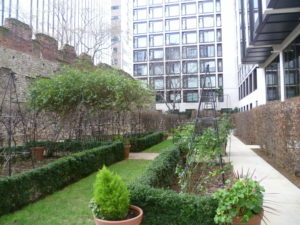 Outside, the bijou garden designed by David Hicks (1929-1998) is also available for hire. 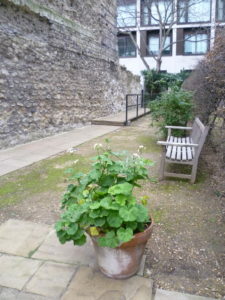 I liked the way it effortlessly included a large section of Roman wall, a number of hornbeam hedges, a classical vase on a plinth, geraniums in red terracotta pots, and several benches, all set against the background of the surrounding modern concrete and glass buildings. It is the sort of place where one can easily imagine oneself having a coffee break, a chat with a friend, or simply enjoying the space. The Salters’ Company has had two of its Halls destroyed and it must have lost many fine and treasured items; and it no longer deals in the salt trade. It has had to reinvent itself, both after the war when it was in desperate need of a new home, and more recently, developing its charitable role for our complicated and challenging modern world. It has done so with energy and panache. 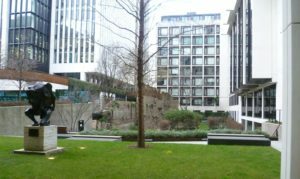 Architecturally, Sir Basil Spence’s Salters’ Hall is quite capable of standing up to its neighbours, and asking David Hicks to design a city garden in such a restricted space was a stroke of genius. 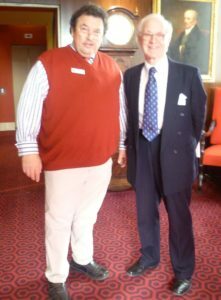 The scope of its charitable works is a wide one and the Salters’ Hall is obviously fully engaged with the modern world.